It was with little forethought and less planning that the Telluride Times issued the first Telluride Magazine in the winter of 1982/83. No one on the newspaper’s staff had any experience with four-color production, but in a place as beautiful as Telluride, a magazine seemed a natural fit. The time was right: Telluride had a master plan, a regional airport was in the works, and the Mountain Village was on the drawing board. There wasn’t a magazine yet, so John Arnold presented the idea to the Telluride Times. Thus, the first local, four-color publication was born. It had been 10 years since the first skier slid off the chair at the top of Lift 6. Ron Allred and Jim Wells were at the helm of the ski area, and they had infused the region with new energy and capital. Billy Mahoney, Sr., was vice president of mountain operations; the Spiral Stairs ski run opened on the mountain’s steep north face; and Helitrax, Colorado’s only helicopter skiing operation, flew skiers to backcountry powder. Ronald Reagan was the country’s president, and George H.W. Bush was vice president. Telluride was yet to be on the radar of the rich and famous. For the cover of that first issue, Jeff Andrew photographed then-mayor Jerry Race and his wife, Pam, cross-country skiing across the Valley Floor. There was nary an inkling of what was to come: that for six years, to venture out onto the property would be trespassing. 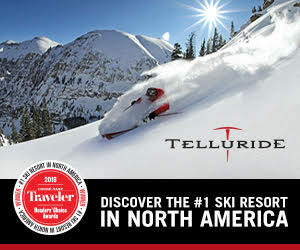 In the magazine’s pages, writer Peter Shelton described Telluride’s passion for skiing in his story, “Taking the Plunge”; another article addressed the divide between the local no-growth advocates and those favoring development; and journalist Peter Jaffe embellished the town’s growing reputation as the summer festival capital of the Rockies. Projections for the region’s future were also addressed. The ski area owner’s had launched plans for the Mountain Village, a championship golf course and a gondola to connect the new development to the town of Telluride. City planners were proposing to pave the streets and build a performing arts center and an indoor swimming pool. We got an indoor hockey rink in 2004 instead of the pool, but the rest is history. With the support of many of Telluride’s most steadfast institutions and new businesses, Telluride Magazine gained momentum. We started out small, using archaic techniques: typesetting on a Linotype, cutting rubylith, waxing copy, pasting ads and stories onto blue-lined layout boards, and translating those layouts to film. It wasn’t until 1990 that we entered the computer age. Peter Spencer introduced the staff at Telluride Publishing to the Apple computer and a software program called Pagemaker. It was one giant step for our out-of-the-mainstream publishing company. We issued a vacation guide for Telluride’s visitor services, and over the next decade, the company produced publications for many regional communities: a dining guide, a properties magazine, and Southwest Colorado Traveler. Throughout the years, we’ve had the privilege of working with some of the area’s finest editors, writers, photographers, artists and designers—and these people have brought mountains of knowledge and talent to the job. Bonnie Beach, who has done everything from accounting to typesetting, still proofs our publications; Debbie Dinkins continues to manage the books; Tor Anderson is not only a talented designer, but also the IT guy behind our complex Mac operating systems; Lise Waring is the master of editing and, among many other things, manages our websites; Paton Stone handles the advertisers with aplomb and grace under deadline; Doug Berry and other local photojournalists color our pages with exquisite imagery; and we cannot forget the physical component of our team in Scott Nuechterlein, who keeps our magazine racks full. Over the decades, Telluride Publishing has not only been a place of business, but also a creative enclave of admittedly like-minded thinkers. And where else but Telluride? In what place do people step away from everything they’re doing to stand in the middle of the street and watch nature’s mysteries unfold? A full, ripe moon rising over Ajax Peak, the lavender flush of alpenglow on snowcovered mountains, a double rainbow spanning the canyon, or a cascade of snow released by an avalanche, billowing into a cloud at the end of the valley. These gifts cannot be bought or sold, and they beckon the spirit of every Tellurider. Nice to see you’re still covering the “Most Beautiful” place on earth.